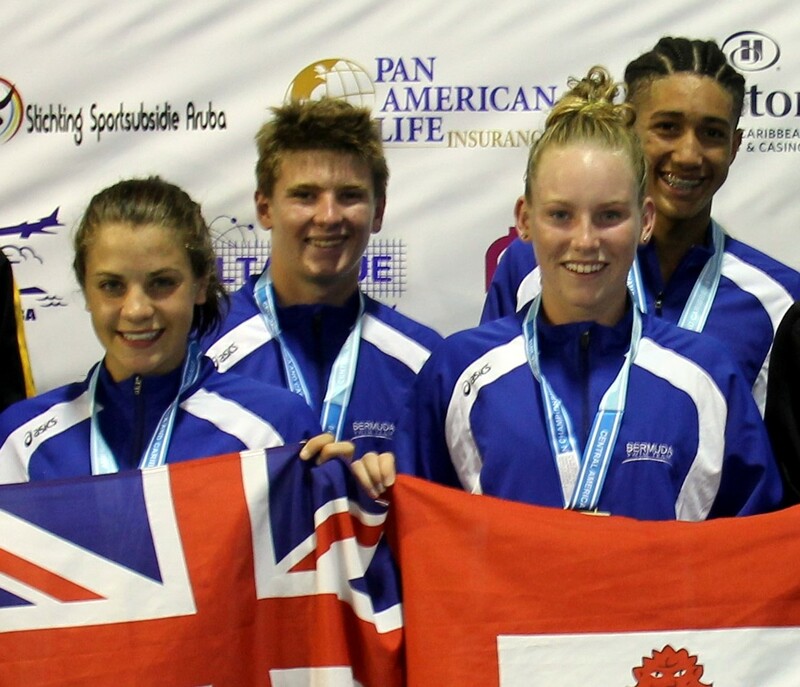 Bermuda swimming has a team of 20 participating at the CCCAN Swimming Championships in Aruba. Bermuda swimmers captured Four Medals during the day, there was also a New Bermuda Record established and a New CCCAN Record set. The first session saw got underway with the Girls 800 Freestyle and the Boy’s 1500 Freestyle. Bermuda captured their first medals with Brian Desmond winning the Silver, Desmond was able to set a new Bermuda record for Boy’s 15-17 Age Group touching the wall in a time of 17:21.15 and Adam Young won the Bronze Medal with a time of 17:47.56. During the 13-14 Girls 800m Freestyle Taylor White finished 4th with a time of 9:48.32, Skyler Powell finished 6th competing in the 15-17 Girls 800m Freestyle and during the 18 & Over Girls 800m Freestyle Vanessa Esposito finished 6th with a time of 59:38.96. The Mixed Relay 4x50 Freestyle finished the night. Bermuda’s 13-14 team of Sam Williamson, Payton Zelkin, Caleb Ingham and Logan Watson-Brown set a new CCCAN record on the way to a Gold Medal clocking 1:45.04. With a time of 1:42.52 saw the Bermuda’s 15-17 team of Madelyn Moore, Skyler Powell, Brett Smith and Kai Legband finished the night off with a Silver Medal.